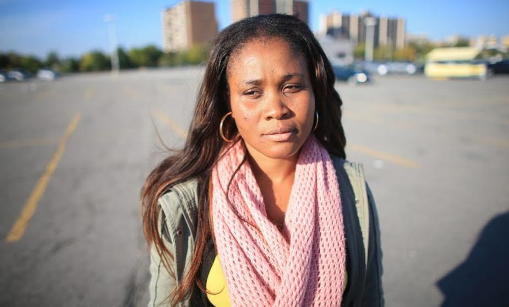 I guess the population of Nigerians in Canada is one less after this unfortunate story of a 32 year-old Nigerian woman, Gift Daniel,who is now facing deportation from Canada after an Ottawa court overturned a decision to grant her a refugee status because of a misspelling of her name in a government birth document from Lagos. refugee appeal division, where the pressing concern was on the identity and not on the merits of the decision," said Daniel’s lawyer, Richard Wazana. "They did not question the forced marriage, abuse and violence." “Gife” while her licence spelled it “Gift” — setting off questions by Canadian officials over her identity. She was detained at the Rexdale immigration holding centre for three months until her release on May 13, 2015, when she was granted refugee status. Despite concerns over Daniel’s identity, refugee judge Shamshuddin Alidina, in granting her asylum, wrote the tribunal "believes, on a balance of probability, that the claimant has persuasively established her identity as Gift Daniel from Nigeria." Daniel has insisted she only became aware of the typo after it was spotted by the border official, the different spellings of her name in her identity documents triggered the government’s challenge to the refugee appeal tribunal to overturn the asylum decision. "Identity is clearly an important fact, so important, that if not established, there is no need to further analyze the evidence and the claim must fail," the government said in its appeal. "Absent a properly established identity, a matter of utmost importance to refugee determination, the claimant cannot be considered to be a credible witness on the material aspects of her claim for refugee protection." In its appeal application, border enforcement officials also noted Daniel could not provide them with details on who helped her obtain the false passport she used to come to Canada and argued that her claim was “assessed on the basis of one facet of the respondent’s alleged identity: survivor of forced female genital mutilation and gendered violence. 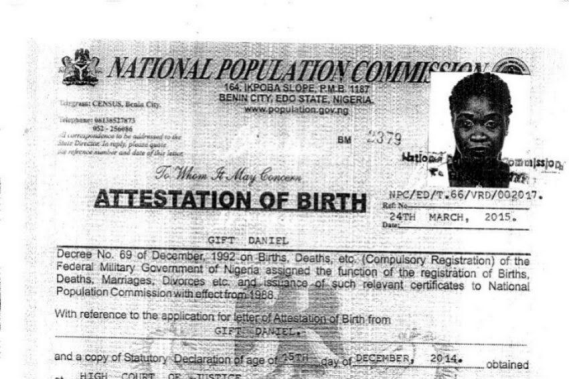 In addition to the error in her name on her birth document, they said her other ID, including two additional driver’s licences she later produced and a voter’s card, were not acceptable proof of identity. Immigration officials argued the driver’s licences, two expired and one current that Daniel submitted bear different signatures and that one expired licence has a picture that does not look like her. 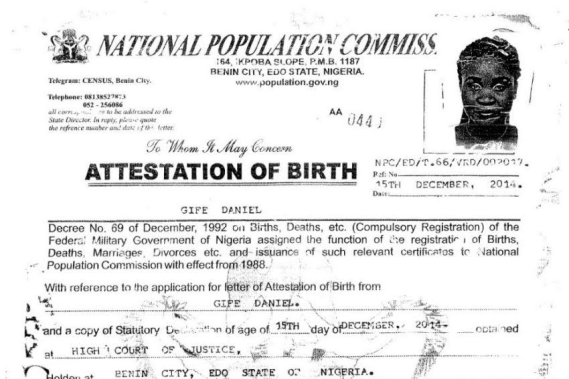 The identity issue was further compounded by a new birth document Daniel later submitted with the correct spelling of her first name. "The RAD finds that the forged document was obtained improperly outside of the normal issuing process and cannot be relied upon for the truth of its content," wrote adjudicator Leonard Favreau. "Regardless, even if the respondent’s friend was able to bypass the process required to obtain a driver’s licence, it is clear that the licence cannot be relied upon for the truth of its content, and as such, cannot be relied upon as reliable evidence of the respondent’s identity." The appeal tribunal also noted the features on one of the licences were faded with muted colours and its webbing security features were barely visible. "Fraudulent documents from Nigeria are available in and outside of Nigeria . . . any printed document can be forged. Genuine official documents such as birth, marriage, divorce, death certificates, ID cards, driving licences and passports can be obtained," Favreau noted in his decision to rescind Daniel’s asylum. In traveling to Canada in possession of a false passport and other false identity documents, the respondent has demonstrated that she has the ability to obtain and the willingness to use fraudulent documents." In challenging the appeal tribunal’s decision against Daniel, Wazana argued at the federal court that the assessment of his client’s identity was unreasonable and the adjudicator could not make a decision solely on identity without considering the credibility of her claims for asylum. "The RAD was not unreasonable in rejecting (Daniel’s) evidence and explanations for the irregular manner in which she obtained the licences. Therefore, the RAD was not unreasonable in concluding that the applicant’s identity had not been established," Federal Court Justice Ann Marie McDonald said in her ruling last month. "I was so happy when my (refugee) claim was granted. I was ready to move on and start a new life," said Daniel, sobbing. "It all started with the typo. Tell me if you never make any error in life, in typing and speaking. This is a huge price for me to pay." It really does seem harsh that Gift will be denied her refugee status because of such a minute detail in the spelling of her name.Sounds to me like the Canadian officials simply don't wanna grant her this status and they found a saving grace.Or maybe they don't believe her story and this was like i said a saving grace for them to deny Gift.I guess there are too many Nigerians living in Canada for their liking.